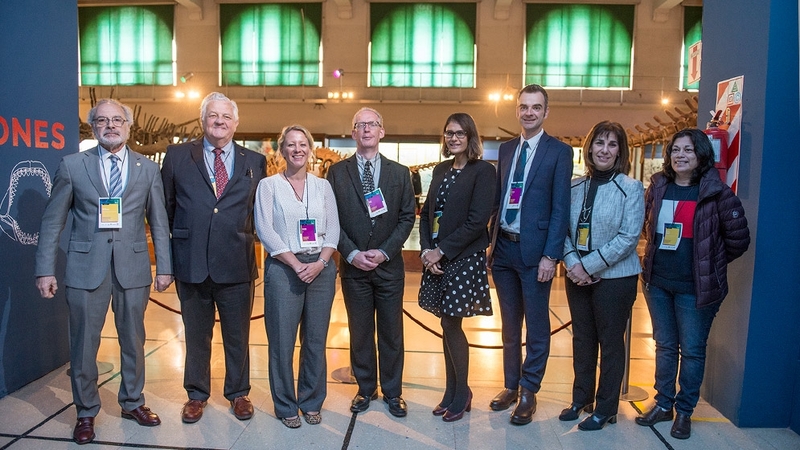 Held in Buenos Aires, the bilateral workshop aimed at bringing closer the Argentine and the British scientific communities and government agencies in order to find potential lines of work. Workshop “Antimicrobial resistance in the Environment”. Photo: CONICET Photography. As part of a Memorandum of Understanding between the Ministry of Social Development and Health of Argentina and the el Department of Health and Social Care (DHSC) of the UK, the workshop “Antimicrobial resistance in the Environment” took place in Buenos Aires. The activity was organized by the Food Safety Network of the National Scientific and Technical Research Council (CONICET) through the International Cooperation Office of the Council. The other institutions that participated in the organization were: the Biotechnology and Biological Sciences Research Council (BBSRC) and the Natural Environment Reseach Council (NERC) under the auspices of DHSC. The workshop was at the Argentine Museum of Natural Sciences ‘Bernardino Rivadavia’ (MACN-CONICET) on the 10th and 13th of September. The representatives who participated in the meeting belong to the above mentioned foreign institutions, CONICET, the Administración Nacional de Laboratorios e Institutos de Salud (ANLIS) “Dr. Carlos G. Malbrán”, the Servicio Nacional de Sanidad y Calidad Agroalimentaria (SENASA),the Instituto Nacional de Tecnología Agropecuaria (INTA), the Centro de Investigación y Asistencia Técnica a la Industria (CIATI) – Asociación Civil and some Argentine universities. The aim of the workshop was to bring closer both scientific communities and government institutions to search for potential lines of joint work on antimicrobial resistance and its effects on the environment. The research would be focused on cattle, poultry and swine production as a prelude to the next call for cooperation projects on the subject. The workshop started with a series of lectures by authorities and leaders from both countries and speed networking sessions between all the participants. After the meeting, there were tours to the establishments of bovine, poultry and swine production of the province of Buenos Aires in Lobos, Roque Pérez, Capitán Sarmiento and Capilla del Señor. Finally, there was a debate in which the researchers shared their lines of work and established their collaboration relationships.